"I think the album is a classic." This is the reissue of one of the best albums ever released! 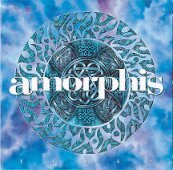 One the top of their creativity Amorphis managed to melt together Melodic Death Metal with Finnish folk music and to create a real masterpiece. In every song a beautiful guitar melody leads us through the compositions. Songs like "On Rich and Poor", "Elegy" or the amazing "My Kantele" (from witch also an EP has been released) remain unique in metal music history! Till nowadays Amorphis haven't manage to compose such intense and innovative music again, even if also their later albums (except for the last one, sorry) are quite remarkable. But this is in my eyes an impossible thing to top this cd. The production of this Album is transparent and at the same time powerful, none of the instruments loses in energy. The grunts are some of the deepest ever heard, and the clean vocals are so typical, that they have become a trademark of Amorphis so that everyone is able to recognize this band by hearing them. This album is, was and will be my soundtrack to melancholic rainy autumn afternoons and the key to higher melodic spheres! Since the release of this cd I often surprise myself whistling the melodies of "Elegy, and I can tell you, they have caught me till eternity!